J.F. 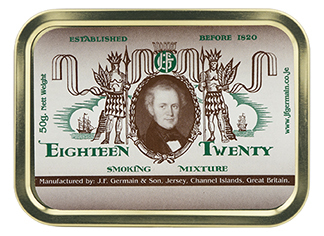 Germain & Son began manufacturing tobacco in 1820 under ideal climatic conditions on the island of Jersey in the British Isles and has played an important economic role there for more than 180 years with its remarkably successful, multi-generational family business. The reconstructed factory is situated on the site of the original premises facing the harbor of St. Helier where Jersey-built schooners once sailed to many parts of the world in search of high grade leaf tobacco for Germain's factory. SPECIAL NOTE: These pipe tobaccos are only shipped to Milan Tobacconists a few times a year and in very small quantities. Because of the high demand/low availability, we do not presell, hold any aside, or notify customers when shipments arrive. We established this policy in an effort to be as fair as possible with the distribution of these highly sought after blends. B.K. 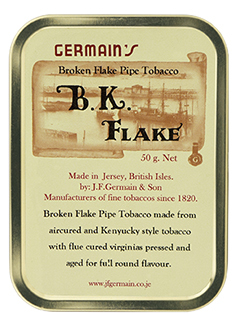 (Broken Kentucky) Flake is a medium-bodied broken flake tobacco blended from air cured, Kentucky style tobacco with flue cured Virginias pressed and aged for full, round flavor. 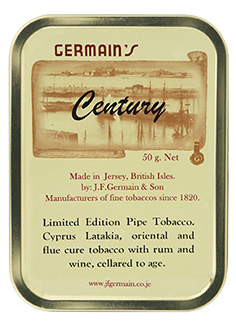 Century is a limited edition, mellow and aromatic blend of Cyprian Latakia, Orientals, and flue cured pipe tobacco with rum and wine toppings that's cellared to age. Named after the year in which J.F. Germain & Son was founded, this English blend of top grade Cyprus Latakia, Oriental, and flue cured tobaccos is geared toward the experienced pipe smoker. 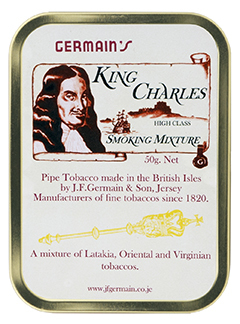 King Charles Smoking Mixture pipe tobacco is an English blend of Latakia, Oriental, and Virginia tobaccos. 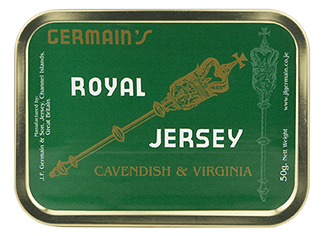 Royal Jersey Cavendish & Virginia is a ribbon cut blend of select Virginia and Maryland type tobaccos carefully blended with fine Oriental tobacco leaf from Greece and Turkey specially processed to produce a mellow smoke with rich flavor. 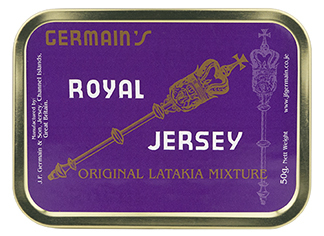 Royal Jersey Original Latakia Mixture is a ribbon cut blend of top grade Latakia, select Virginia and Maryland type tobaccos, and fine Oriental leaf from Greece and Turkey. The special process employed produces a mellow, flavorful smoke. 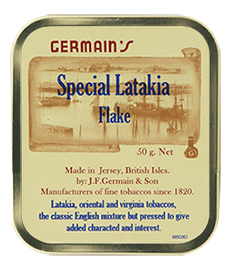 Special Latakia Flake pipe tobacco is a classic English blend of Latakia, Orientals, and Virginias that are pressed to give additional character and interest.